If your group members are looking to illuminate their lives and recharge their health, this is a great place to begin! Take a step beyond yoga and meditation into the empowering realms of high-vibration sound healing, aura reading, energetic healing, and other pioneering fields in health, spirituality and technology. This event offers three days of nationally recognized speakers, a range of workshops, and a broad variety of exhibitors offering the latest in wellness, healing and holistic living products and services including vitamins and supplements, non-GMO, organic and raw foods, coaching and counselors, health-related practitioners, green products for the home, and astrologers, numerologists, mediums and more! The whole event is planned for September 7-9 at the historic DoubleTree Suites by Hilton Hotel Detroit Downtown - Fort Shelby, where there are so many new and exciting things to experience in the city’s rebirth. Don’t miss the opportunity to embrace health, wellness and spirituality with like-minded friends! The Girls Getaway Weekend in Port Austin, September 21-22, is billed as “a weekend full of fun, fashion and food.” What could be better than that? How about raffles, live entertainment, a walkable scavenger hunt with prizes, lots of yummy treats, and gift certificate giveaways? The event includes lots of time for shopping during Ladies Day at the Farmer’s Markets as well as at the Village Green Tiny Shops. Already thinking about Christmas? There’s no better place to get ahead of the season with a girls getaway than in Frankenmuth, home of the world-famous Christmas retailer, Bronner’s Christmas Wonderland. Shopping is key to this trip but there’s also plenty of time for taking a Frankenmuth FunShips boat tour, with or without wine and chocolate! Before you go, don’t forget to browse the River Place Shops offering everything from clothes and toys to baked goods and other eatables to beer and wine! 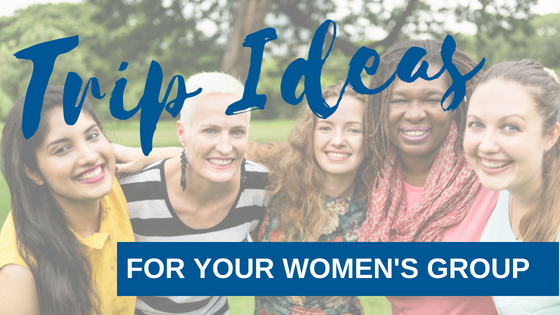 This event is sponsored by Women 2 Women Michigan Magazine and is coming to Flint with two days of amazing and inspiring activities, ideas and products designed just for women. Day one, October 5, is the Summit that’s jam-packed with workshops, health and educational speakers, fashion shows, dancing and exercising, general pampering, shopping, and home improvements ideas. The Expo is on day two, October 6, with exhibitors offering products and services with something for every woman. Options will include clothing, accessories and jewelry, cosmetics, health and home décor, as well as experts in finance, motivation, education and more. Plan to stay at the Holiday Inn Gateway in Flint and enjoy a relaxed, fun but inspirational trip with all of your favorite female friends! No matter where you travel you can always depend on Indian Trails to get you there and back safely and in luxury. Find out more and book your charter motorcoach today!